If you live in a northern climate, or use your hot tub year round, then you will want to make sure it comes equipped with a heater. Note that some models, especially the plug and plays, do not come with a dedicated heater. While many 120 volt spas may come equipped with a heater, you will only be able to run the spa pump or the heater at any given time – not both together. There are several things you need to be aware of to protect your heater. The first is poor spa water chemistry. It is important to regularly (2-3x a week) test your hot tub water with a water test kit or test strips. Keep the pH in balance –between 7.2 -7.8 – and adjust your water chemistry as needed. When your pH drops below 7.2, the water becomes acidic and can cause corrosion or rust on your metallic heater elements. If you live in an area with hard water containing lime or calcium, your heater elements may develop scale. This white coating of plaque will build up over time, causing your heater to work harder and eventually cause your heater to burn out. It is always a good idea to get a pre-filter for your hot tub if you live in a hard water area. Air can also cause issues for your hot tub heater. Low water flow, air bubbles or air inside the heater chamber can mean a shorter lifespan for your spa heater. You will want to ensure that you don’t have low water flow issues. 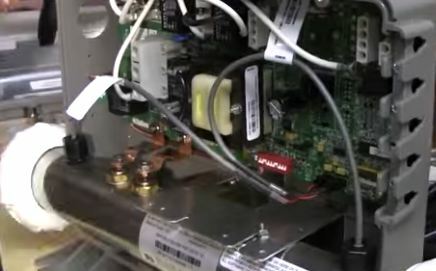 Check your control panel for messages and regularly clean your spa filter. Despite proper maintenance, there will come a time when your spa heater will need replacement (generally after 8 years). This may occur after it stops heating properly or does not heat at all. You can use an electric meter (available at any hardware store) to test for short circuits or resistance on the heater body or terminals where the wires connect or, better yet, get a repair tech to check out the problem. There are both high flow heaters and low flow heaters built into hot tubs, depending on what brand and model you have. You will want to get the correct replacement heater since it is part of your entire plumbing system and the wrong replacement will cause further issues down the line. Check the label on your heater for the stats you need to order a spa heater replacement online. The important factors to duplicate are the size and electric specifications (voltage, wattage, amperage, etc.). 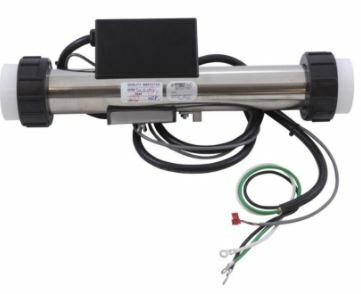 The most popular hot tub heaters are the 4.0 Kw and the 5.5 Kw universal heaters. However, you also need to match the wattage (1.0/4.0/5.5 etc.) and the voltage (110,120, 220 or 240) so you are choosing the correct heater for your spa. Before you replace your spa heater, make sure there isn’t a separate reason why your water is not heating sufficiently. Often, a dirty spa filter can cause water flow problems, so take out and rinse or replace the current filter if it is dirty. There could also be some issues with the plumbing, like clogs or partially closed valves. If you have a low kW heater, it may have trouble heating the water sufficiently in very cold weather. Unfortunately, you cannot simply buy a bigger heater and install that instead. You have to replace the broken heater with the exact same one, since adding a stronger heater could cause a fire, burn out circuit boards or simply not work. Invest in a thicker cover to help prevent heat loss so the spa will retain more heat when not in use. If your water is stone cold, then check that the circuit breaker or GFCI has not tripped. See if there are any error codes on your control panel. Change settings by entering a higher temperature to see if the heater kicks in. It could be that only the internal heater element is broken, which is cheaper to replace than the whole heater. However, you would have to know how to safely install it and understand it is more difficult to do properly. If your heater is old, it is better to replace the whole thing. A new heater will be more efficient and have newer sensors. It is easy to replace as long as you order the correct replacement heater. Open up your spa cabinet to look at the brand of your spa pack (which is the control pack and heater together). Generally, all equipment will have a label so you can read the brand and the specifications. If you can’t find or read the label, you should still be able to see the information imprinted on the heater unit itself. You will want to take the physical measurements of the heater to make sure it is the same size. When you are ordering your heater, check if you need any union o-rings, hi-limit or pressure switches. Always make sure that you shut off the power to the spa and close up valves before you try to remove the old heater. 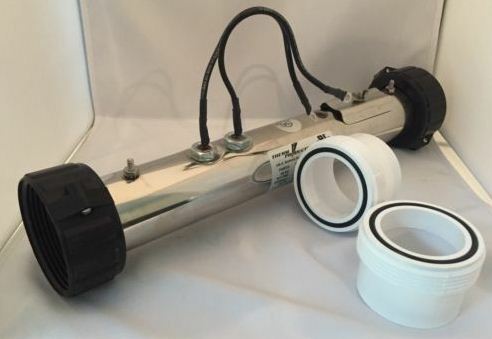 If you are unsure which replacement spa heater to order, then simply send a photo of your heater label/heater along with the dimensions and model of your spa to: info@hottuboutpost.com. We will send you back a ling to order the correct heater for your spa make and model. We have discounted prices on all the most popular models including Gecko, Balboa, HydroQuip, Hot Spot, etc. You can also find spa heaters by hot tub brand. We also carry spa packs, controls packs, O-rings, and other hot tub spare parts, so there is no reason to be left out in the cold!